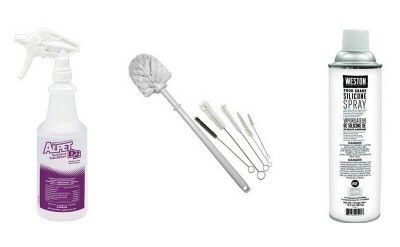 Sanitizing and cleaning supplies are a must when doing meat processing at home. You will also need lubrication on those moving parts and to keep rust from forming after cleanup. Alpet D2 Surface Sanitizer is safe and easy to use on your meat grinder, cutting boards and kitchen counters. Food grade Spray will keep the moving parts lasting longer and it makes clean-up even easier. Food Safe Lubri-Film grease is used to lubricate the O-ring on your Sausage Stuffers. Lubri-Film Plus Sanitary Lubricant - 4 oz. Haynes Lubri-Film Plus is a heavy duty sanitary lubricant with extended performance, low friction properties. This lubricant is authorized by the NSF rated H1 for use in food processing plants for incidental food contact. All ingredients are FDA approved. Haynes Lubri-Film Plus is designed for longe..